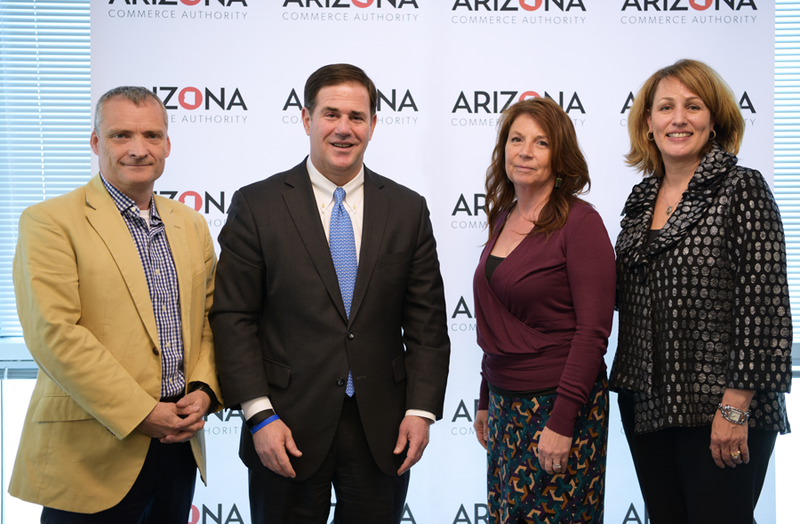 Neal Beswick (VP Business Development) and Margaret Mitchell (VP Product R&D) meeting with AZ Governor Ducey and the President & CEO of the ACA, Sandra Watson. Biotechnology and life science company Resonea Inc. was chosen as a recipient of the Arizona Innovation Challenge (AIC) Fall 2017 Awards, powered by the Arizona Commerce Authority to recognize and stimulate early stage and start-up companies. In addition to the Award recognition, Resonea will receive $250,000 in funding from the AIC. Resonea, founded in 2016, researches and develops medical-grade digital health tools to help consumers understand the importance of sleep breathing health, and determine and manage their risk for sleep disorders, including obstructive sleep apnea. AIC recognizes and awards companies who demonstrate innovative potential in high-growth industries. It awards $3 million annually, split between the Spring and Fall Challenges, to the most qualified, innovative companies, in order to advance their technology commercialization opportunities. Resonea’s expertise stood out among 115 applicants to the Fall Challenge. The companies were judged using stringent criteria, which included assessing their technology potential, marketing strategy and the quality of their management team. “Our mobile software system can also educate people about the risks to their bodies when they have poor sleep health, increasing their awareness and motivation to seek medical help when needed,” continued Dr. Sehra. Obstructive sleep apnea (OSA) is an undertreated disease which may cause or worsen numerous health conditions, including high blood pressure, diabetes, stroke, congestive heart failure, atrial fibrillation, depression, erectile dysfunction, dementia and Alzheimer’s Disease. OSA affects 20-25 million adults in the U.S. and the risks increase with aging, weight gain, stress and some medical conditions. Detection and treatment of underlying sleep disorders can be a crucial step in successfully addressing many of these diseases. Additionally, sleep disorders are now recognized as the number one cause of lost productivity and work days for employers. According to the National Institutes of Health (NIH), chronic sleep loss or sleep disorders are estimated to cost more than $60 billion in lost productivity to U.S. companies alone. Stacy Jones, Common Giant Agency for Resonea, Inc.
Headquartered in Scottsdale, Arizona, RESONEA was founded to develop a new standard for understanding sleep breathing health and its impact on the human condition. Our mission is to develop medical-quality sleep diagnostic tools that are directly accessible to consumers, in order to accelerate the detection and treatment of often hidden sleep disorders.